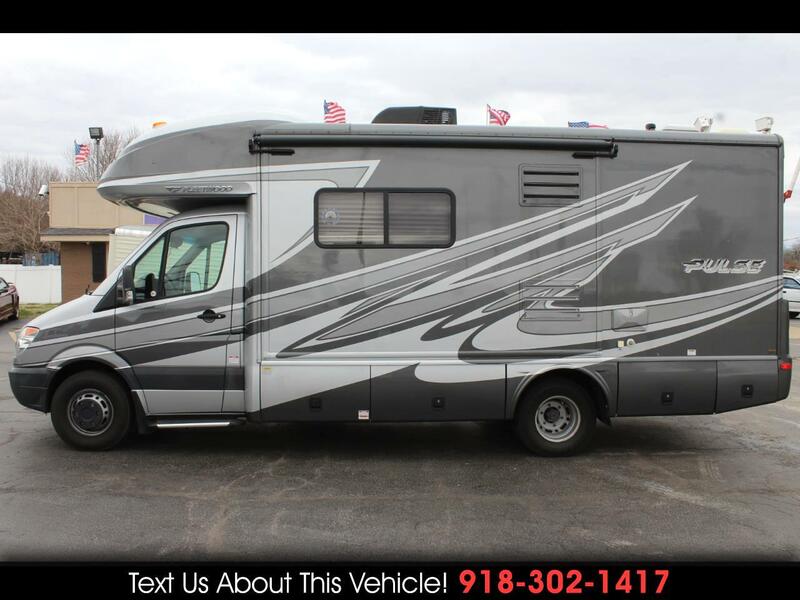 2010 Fleetwood Pulse 24D Class C Motorhome, 2008 Dodge Sprinter Chassis, Mercedes-Benz 3.0L V6 Turbo Diesel Engine, 5-Speed Automatic Transmission, Leather Driver and Passenger Seats, In-Dash AM/FM Radio with CD, Ipod Cable and AUX Input. 1 Power Slide Out, 1 Awning, Complete TuffPEX Plumbing System, Demand Operation 12V Water Pump, 13,500 Btu Ducted Air Conditioner, 25,000 Btu Furnace with Wall Mounted Thermostat, 6 Gallon 110V/LP DSI Water Heater, Aircraft Style Overhead Contruction with Curved Plyform Cabinet Doors and Integrated Accent Lighting. Cabover Entertainment Center with 32'' TV and Home Theater, Cummins Onan RV QD 3200 3.2 kw Diesel Generator, Dometic 2-Burner Stainless Steel Cooktop with Tempered Glass Lid, Dometic Stainless Steel Sink with Tempered Glass Lind to match Cooktop, Dometic 6 cu.ft. Refrigerator/Freezer, Convection/Microwave Oven, Bedroom with 52'' x 74'' Mattress, Curved Storage Compartment, Reading Lights and 18'' TV, Bathroom with Bath Door, China Bowl Toilet with Hand Sprayer, Medicine Cabinet with Mirror, Shower Head with Flexible Hose Extension, Molded ABS Shower/Tub with Surround Shower Pan, Wheelbase 170'', GVWR 11,030, GCWR 14,530, Hitch Rating Weight 3,500, Tongue Weight 350, Overall Length 25'2'', Overall Height with AC 11'4'', Overall Width 91.5'', Interior Height 80'', Interior Width 88'', Fresh Water Holding Tank 29 Gallons, Grey Water Holding Tank 33 Gallons, Black Water Holding Tank 33 Gallons, Water Heater Tank 6 Gallons, Appliance Propane Tank 24 Gallons. For more information give us a Call at 918-371-8888 or send us a Text Message at 918-302-1417. Message: Thought you might be interested in this 2010 Fleetwood Pulse.